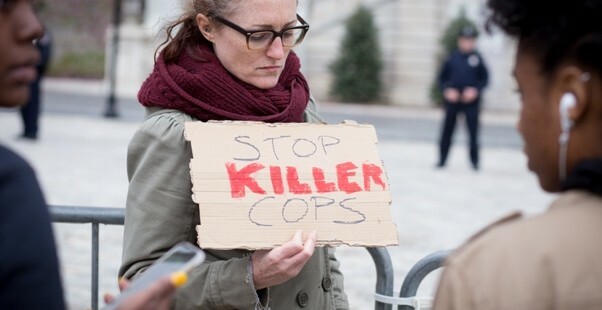 Nearly a hundred gathered in front of Baltimore’s City Hall on Thursday afternoon protesting police brutality in the death of Baltimorean Freddie Gray. 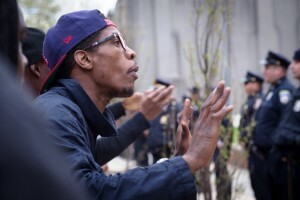 Gray died on April 19 from a devastating spinal injury, a week after police had taken him into custody. The six arresting officers are currently under investigation and have been suspended. 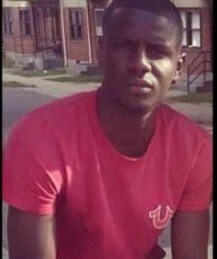 Gray, 25, was arrested on April 12, 2015, in a neighborhood known for drug deals and violent crimes. Gray took off and ran upon seeing police officers at the scene. Officers chased and tackled Gray and took him into custody at 8:40 a.m., after finding a switchblade in his pocket. Two bystanders captured the incident with video recordings. Gray was placed in a transport van within 11 minutes of his arrest, and transported to the Western District police station. About 30 minutes later paramedics arrived to take him to a hospital. He was in a coma within the hour and died a week later. The department released the officers’ names: Lt. Brian Rice, 41, Officer Caesar Goodson, 45, Sgt. Alicia White, 30, Officer William Porter, 25, Officer Garrett Miller, 26, and Officer Edward Nero, 29. Three of the officers were on bikes and initially approached Gray, another made eye contact with Gray, a fifth officer joined in the arrest after it was initiated and one drove the police van, police said. Five of the six have provided statements to police. One officer refused to provide a statement. At the City Hall protest, the mostly African-American crowd, which included activists and concerned citizens, directed their anger at Mayor Stephanie Rawlings-Blake and the Police Department. “No justice, no peace,” shouted a group of protesters led by Rev. 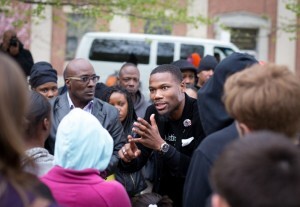 Westley West, founder of Baltimore based Faith Empowered Ministries, as members of the crowd challenged the Mayor to come outside and answer questions. West, although seemingly confrontational, urged followers to remain calm and reject violence, even when some in the crowd recommended otherwise. “We are all about unity and [building] strong communities,” West said. As the day wore on, the crowd grew exponentially and descended upon the nearby police station where confrontations intensified. 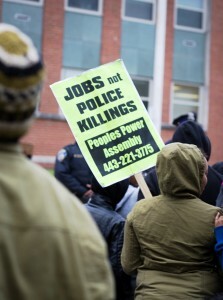 By 7 p.m., the crowd in front of City Hall had largely dispersed. But a number of the protesters who remained expressed outrage when asked about reports that they had been compared to a lynch mob. When asked about the city police union’s characterization of the peaceful demonstrators as a “lynch mob,” West said he found those remarks “regrettable,” but said justice can be achieved working within the system. Glova Scott, Socialist Workers Party member and candidate for DC city council, did not share West’s optimism. “Police [exist] to protect the rich, and see [people] like us as criminals,” Scott said. Across the plaza, a handful of protesters gathered on the corner of West Fayette and Gay Streets to wave “Black Lives Matter” signs at passing motorists. Several motorists honked their horns in solidarity with the protesters. But most chose to focus on Freddie Gray and the fate of the arresting officers. “They should be charged with first-degree murder,” said 31-year old Brandon Johnson who attended with his family. Will Sparrow, 41, whose brother is a police officer, was more cautious. “It’s hard to say; the evidence must first be examined,” he said. Sparrow, a Navy veteran and skilled in martial arts, said police are no different from civilians, and they don’t purposely target people. “Who knows what happened? Ask the police!” said Roger Cooper, 47, when asked what he thought happened to Gray. Cooper stated almost everyone in his community had been victimized by police at some point and held a poster listing names and pictures of African-Americans who had been killed by officers over the past few years. One man was disenchanted with local race-relations. 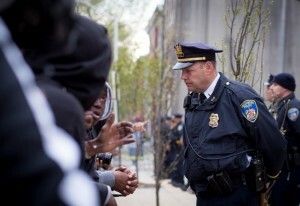 “Baltimore is a segregated city, and everything is [linked] to race in one-way or another”, said J.C. Faulk, 54. Protests are expected to continue throughout the weekend.